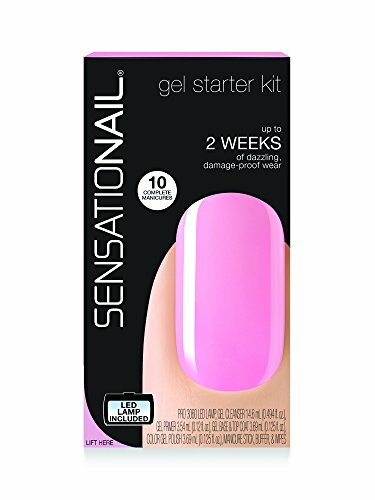 Gel Nail Kit Review "Sensationail by Nailene"
I have always loved the idea of gel nails once they hit the scene. I am quite rough with my nails and the thought of not needing a manicure for a few weeks was a great thought to me. My only issue was every time I went to the salon it was 25$ later. I can spend money on pampering myself just like anyone else, but when I saw this at home gel nail kit by, Sensationail I needed to give it a shot. It costs about $50 for the kit. Online I was also able to find a 10$ off coupon, which helped. The kit comes with the cleaner (which I think is just plain rubbing alcohol), Primer, Base/Top Coat, One gel color (I had the pink chiffon), and the UV light. I have never been great at painting my own nails so that was my first concern. My second concern was that the nail color that came in the kit was so tiny that I thought I would only get about 2 applications out of it. Which turns out to not be the case. The directions were very easy to follow, simply file and clean your nails and off you go. One layer of primer, let that dry, then the base coat, followed by the color and top coat. After each layer you cook in the UV light for 30-60 seconds. The light stays on for 60 seconds with a tiny "beep" when it hits 30 seconds. And here the absolute BEST part about the gel nails...they are dry as a bone as soon as you are done with the last coat! If you are as impatient as I am you understand just how important that feature is! I would always end up with a smudge of some sort just waiting for my nails to dry with regular polish! To remove these nails you just need to buy some acetone remover from the drug store and some cotton. Let them soak for about 15 minutes then they bubble up and slide right off! Ready for your next application. The nail polish colors themselves are about $10 each. They do have a wonderful selection of colors along with "seasonal" colors every once in a while as well. At the end of the day the $50 spent was a good one. I feel that I can get many uses out of the starter kit before I need to purchase anymore bottom/top coat or primer. The colors on the other hand is where I will spend some money since I lose interest in colors quite fast. It can also sideline as excuse to get your ladies together for a nice night of wine and nails! Just have them bring a color and bring you some wine or dinner and you can all get a gel manicure instead of spending your money at the salon!